Stupid Google Tricks: How often do you cut your hair? Then I was reading Google Apps Hacks and Hack 25 caught my eye: “Show the difference between two dates”. A formula like “=INT(A2-A1)” will automatically compute how many days passed between the date listed in cell A1 and the date listed in cell A2. 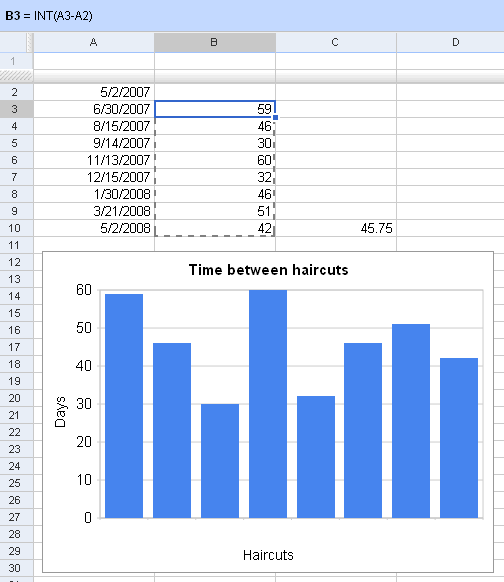 Then it’s just 2-3 mouse clicks to add a graph of the time between haircuts. And if you use the “=AVERAGE(B3:B10)” formula, you can see that on average I wait 45.75 days between haircuts, or about 6-7 weeks. As silly as this first seemed it could come in real handy in lots of industries. Time to start playing with Google calendar in the office. (but I know what you mean!). lol, this is one of your funnier posts, eh? You gotta *love* silly examples such as this one. Thank you for the tips, Matt ! Who still makes hair cut appointments? I’ve just walked in to the barber shop and waited no longer than 10 minutes every time. It’s much easier and lets me get it cut on a whim. Also, doesn’t Google have barbers on campus? Or do you still have to make appointments with them? So Matt, is your birthday around the middle of September? That would explain the first unusually short gap, if we assume the second earlier-than-usual haircut is for visiting relatives at Christmas! Really cool. I look forward to seeing tighter integration of features like this in the future. My only issue with using something like Google Docs is that if my data disappears, oh well. The user is at the mercy of your backup systems. Granted yours are likely a ton better than the average users so I suppose its mostly a win win. Mine is two to three days on average. Longer than that and I feel like a hippie. Wow, if my wife saw this post she would realize that I am not that geeky at all! I wait only 21-28 days, or about 3-4 weeks! Ryan, I’ve tried the “get a hair cut at the drop of a hat” and the “make an appointment in advance” approach. Scheduling the haircut in advance seems to get me slightly better results. I will try out some stuff like urz..
Matt, Just wait until you have kids!! and then you will see how much time you have left in your day for such activities. The main problem with Google Calendar is search. When you search for something and press the Enter key, it searches within public calendars, instead of your own calendar(s). Do you really think Google Calendar users care about public calendars at first when they are searching for an event??? I don’t think so. Yup, Matt. It’s time to get out more. Matt, I need more data! Do you use clippers? I shave my head but used to get a high and tight with the #2 guard on the sides or #3 on top. If you have the hair dresser / barber style your hair then the length would be different each time. Did any conferences force you to get a nice trim before being a keynote? I’ll shoot you a reminder on June 17th. Just ask them to pull up a Google spreadsheet so they don’t have to count out the days. A great plug! Thanks for the educational laugh. I did pick something up from that. 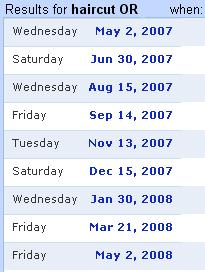 I didn’t have to worry about the Y2K bug messing up my own haircut calendar because the periodicity is 100X yours, say, 20 years. June and December are pretty big outliers did you get your hair cut in October and just forget to put it in the calendar? A spontaneous act? Letting your hair down? Is the INT function needed? I would have thought it’s only needed for dates AND times. In most spreadsheets, dates are stored as whole numbers with 1 representing the start dat for the Application. Times are stored as decimal portions of 1, with 1 being 24hrs. Matt, off topic I know, but you are not answering me in the relevant topic. Matt, if don’t like Google to be seen sponsoring ‘how to spam us’, why not raise the concern WITH relevant Google department as apposed to removing my link that shows Google sponsor the SMX? This is a serious question from a VERY concerened white hat Webmaster. That actually has some great uses for tracking sales and aiding forecasting for regular customers. (or at least it seems a lot easier than our current system) thanks Matt – I’m off to implement it in our office right now! Way to much time on your hands!! Never really put that much thought into scheduling a haircut. Would you be kind to tell us how to remove the URL of a robots.txt file which got indexed by Google (for example http://www.sample.com/robots.txt) while continue making robots.txt file available for googlebot to crawl it? I don’t know what makes me more jealous, the fact that your one of the baddest SEOs or that you can go 2 months without a hair cut. You don’t seem to surprise me, but Google can rather put all those functionalities in one box..Anyway..funny enough I remember when next by just when the hair starts itching lol..
Dude, it’s even easier than that if you’ve got the right head. Step 2) If shagginess > acceptable level, hand razor to GF/wife/significant other/all three and wait 10 minutes. I don’t know which is more nerdy, the post itself or the fact that I actually read the whole thing. Interesting post though. Matt Cutts gets his hair cutts. This seems like a lot of work for a “labor saving” trick… My time/effort/etc saver for haircuts was to figure out how frequently I want to cut my hair–every three weeks for me (I’m a guy with relatively short hair)–and then have a “standing” appointment, every three weeks, same person, same time, every third Thursday. I used to do it every fourth thursday, but that was too long (though luckily I didn’t require graphs to figure that out). At first, I thought to myself “wow, google stock options helps it’s senior employees work on silly questions,” but then just sat back and realized you were giving us a stupid example to probably a useful tool. Chilli, glad that you got a good idea out of the tip! Harith, I think the url removal tool would let you do that. Options 1 & 2 not applicable. So we are left with option 3. WOuld you be kind to tell us how to blok http://www.sample.com/robots.txt while continue allowing Googlebot access to robots.txt? Don’t get me wrong, i love Google App’s…but hasn’t MS Excel been able to calcualte the number of days between dates…forever now? Harith, now that I think about it more, why not use a noindex directive in the robots.txt file? Funny… good post, the real question is where do you get your hair cut…?